Tau Devi Lal Cricket Stadium in Sector 3 here is set for a facelift with the Indian Cricket League (ICL) spending around Rs 4 crore for the Twenty20 tournament scheduled for November 25. Two residents of Colony No 5, both in their twenties, were killed in a road accident after their motorcycle was knocked down by an unidentified vehicle near the Housing Board Chowk in the wee hours today. The third person, who was riding on the same motorcycle, had a providential escape. To check the incidence of rash driving, the Chandigarh administration has decided to keep the traffic lights operational till 12 midnight. A 27-month-long investigation and questioning of several persons failed to give yield results in the brutal murder case of 40-year-old Raj Kumar, a sweeper with the UT health department. 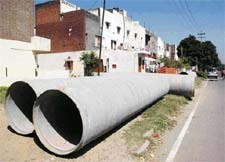 The laying of a major water pipeline along a V-3 road in Sector 30 has hit a roadblock because of encroachment on public land. The high-capacity supply line is to be laid at a cost of Rs 5 crore to interconnect the Sector 26 water works with those in Sector 32. 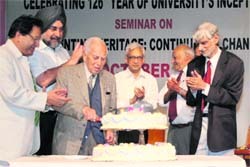 The first meeting of the Panjab University Senate was held at Barnes Court, Shimla on October 14, 1882.Today, in commemoration of that day, an academic celebration marked the 126th year of establishment of the university at Lahore, then known as University College. Almost two decades after the Ministry of Finance issued instructions for appointment of authorised representatives of foreign suppliers, not a single such agent has been registered by the Defence Ministry. 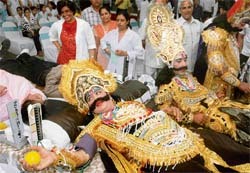 Ramleela artistes joined the voluntary blood donation movement when Ravana (Sunil Sharma), Meghnath (Ashwani Sharma) and Kumbhakaran (Mahesh Kumar) of the Sector 17 Parade Ground Ramleela donated blood at a blood donation camp held at Agrasen Bhavan, here, today. For Vikram Verma, a CA student, failures are the stepping stones to success. A failure in the management information and control system (MICS) paper of the CA exam has prompted him to write a book on the same subject. It’s time for the otherwise-reticent Bengalis to display their indulgent streak. And they are doing so in abundance 6 pm onwards, every day, at Banga Bhavan, where they are preparing to welcome the Devi. Following its decision to create low-income housing for those working at Technology Park, the Chandigarh administration has decided to develop housing and infrastructure facilities at Hallo Majra village. Amarjeet Singh, a resident of Sector 45, has complained that a bottle of a popular brand of beer bought from a liquor vend in Sector 37 had insects in it. Shiv Kumar, a 31-year-old labourer, was found hanging at his home in Colony No. 4 here yesterday. Though no suicide note was recovered, the police termed the incident a suicide. According to the police, Shiv Kumar was found hanging in his room by his neighbours around 7.30 am. 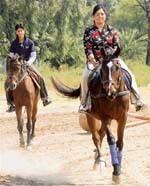 Savita Bhatti, chief executive officer of Jaspal Bhatti’s film school Madarts today accompanied the institute’s students on a horse-riding session at Royal Horse Riding School in Sohana. Not such a great horse rider, the actor-satirist, who has been an equal partner in her husband’s growth and fame, was determined nevertheless, to make a statement in confidence. The allottees of plots of sector 76-80 today held celebrations in view of the possession of their plots at Rose Garden in Phase 3 B-I. The ‘lungs’ of the city were lying in a neglected state for long, till the children pressurised the administration to take steps for their beautification. Today, the children of Phase 10 here are helping the GMADA authorities to undertake a unique project of sprucing up two parks. 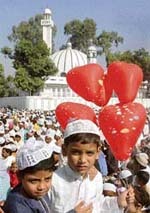 Chandigarh, October 14 Muslims across the city celebrated Id-ul-Fitr with religious fervour and gaiety today.Thousands of worshippers gathered at the Jama Masjid in Sector 20 this morning to attend special congregational prayers. Prayers were also held in Sector 26, Mani Majra and Dhanas and Muslims in large numbers greeted each other. Members of the Safai Karamchari Union burnt the effigy of the UT administration in Sector 25 today. Dr Ajit S. Puri, a resident of Patiala and a consultant in the department of medicine, Mohan Dai Oswal Cancer Treatment and Research Foundation, Ludhiana, presented his book “Speaking of how to prevent common diseases” to Vice-President of India Mohammad Hamid Ansari at New Delhi on the eve of Id ul Fitr yesterday. The local police has apparently obtained some vital clues to the theft of Rs 2.82 lakh from Reserve Bank of India office in Sector 17. Ghan Shyam, who was admitted to the hospital after he allegedly set himself afire at his residence in Kishangarh village, near here, succumbed to his injuries in the PGI this morning. Acclaimed light classical vocalists Agnihotri bandhu from Lucknow presented a devotional musical soiree “Bhajan Sandhya” at the Mata Mansa Devi Sthal as a part of the ongoing Ashwin Navratra Mela being held at the shrine complex. The National Theatre Arts Society (NTAS) organised a Punjabi musical play, ‘Nahin Labhne Laal Guache’, at Baradari Gardens on the completion of six years of the Patiala Gardens Theatre Movement. Sacred Heart Senior Secondary School-26, won the top honours in the girls’ u-19 category, beating Bal Bharti Public School, Pitampora, Delhi, 2-0 in the North Zone I CBSE Tennis Tournament today. The tournament is being played at Mount Carmel-47here. Mehak and Harnoor of Sacred Heart beat Charuta (6-3, 6-2) and Pradhi (6-1, 6-0), respectively, to clinch the title. I.P.S. Mann and Sandeep Sandhu have made it to the Chandigarh Golf Club team for the north zone regional final of the McDowell's Signature Club Golf Championship. The regional final will be played at the Noida Golf Club on October 15. Navdeep of Panjab University garnered 320 points to clinch first place in the individual 30 metres (men) category during the All-India Inter-university Archery (Indian round) Men and Women Competitions held at PU grounds, here, today. With his fine knock of 77 runs, Shivam Khurana propelled Sanjay Public School, Sector 44, to thumping 143-run victory over DAV School, Sector 15, in the PCA-Boost Inter-school Cricket Tournament at DAV Senior Secondary School, Sector 8, today. Mandeep Kaur bagged gold medal in the single scull event for girls during the Chandigarh State Junior Rowing Championship for Boys and Girls held at the Lake Club, here, yesterday. Chandigarh Club emerged winners in the senior boys roller hockey championship in the All-India Open Sardar Sewa Singh Johal Memorial Roller Skating Gold Cup Championship-2007. The event was held at the newly constructed rink of the Banyan Tree School in Sector 48, here today. Riding high on the century by Arshdeep, who hit 157 runs, Yadavindra Public School (YPS) crushed Gem Public School by 197 runs in the PCA-Boost Inter-school Cricket Tournament at the YPS grounds here today.